Every town that has sports fans has that one character. One person that spends their whole career in that town as a journalist, announcer or sometimes both. Fans relate to those types of people and after a certain amount of time consider them part of the family. A strong sports town like Cleveland has one of those types of people. Dan Coughlin has spent his life weaving himself into part of the fabric of Cleveland sports. Now he has a new book out re-living some of his greatest memories. Coughlin, as mentioned above has spent his entire career and life for that matter in the Cleveland area. He has endeared himself to fans and become a part of the Ohio sports family. During his career he has covered more than just baseball as does this book, but I figured that he has also been such a mainstay in Cleveland baseball that his book should be acknowledged. This is the third in Coughlin’s series of books where he looks back on the highlights of a career spent in Cleveland. He re-lives some of the great stories and characters that he crossed paths with through the decades. If you are from Cleveland or have spent any time in the area taking in the sports scene, you will really enjoy these stories. Now for those of us who have never lived in Cleveland or witnessed Dan Coughlin’s work first hand, this book still has some appeal. You may not identify with Coughlin on as strong a level as Cleveland fans but you will still be able to enjoy the history contained in these stories. It gives outsiders an inside pass to what Cleveland sports has to offer behind the scenes. It also offers a history lesson about Cleveland sports that may be difficult to obtain on any other level except for a lifer at the heart of the action. As I mentioned above, it does cover sports other than baseball. On the other hand it does offer a fun look at Cleveland sports and allows the reader to engage in the sports history of a new city. Readers should check it out, because there is is some funny stories contained in here as well as some detailed history. Some stars rise to the pinnacle of the game slowly and come back down at the same rate. Others reach the pinnacle and in one quick move come screaming back to earth at an alarming speed. Steve Blass unfortunately falls into that second category. 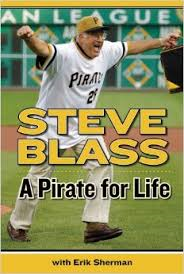 Throughout his career, Blass was a superstar pitcher for the Pittsburgh Pirates, but then one day he lost it all. He basically lost all his pitching control and was unable to find home plate again. No reason was ever figured out for Blass’ loss of control but it became a career destroying problem. Today’s book takes a look at how perseverance and a positive attitude can help you make lemonade out of lemons in this game of life. Steve Blass had a pretty good career. The only problem was it was cut short due to a baffling illness. He lost all his control and his career plummeted. Most players that would be the end of the story but luckily for baseball fans, that is not the end of his story. Steve Blass turned his damaged and essentially dead career into a lifetime of being a contributing member of the proud Pittsburgh Pirates family. A Pirate for Life takes a look at Steve’s entire life. From his humble upbringings to his rise to stardom on the mound. You see his World Series triumphs as well as a few bumps along the way. You get an in-depth look at the ultimate demise of his career and the toll it takes on him personally. All that being said you see Steve Blass’ perseverance and strength come through. You see him embark on a new career and becoming his own institution in Pittsburgh as a member of the broadcast team. It shows the type of quality person Steve Blass is and how he overcame his obstacles to build a life and career he can be proud of. Personal strength is an underlying theme in this book, and I think it unintentionally gives the reader the message that with confidence, dedication and whatever your own measure of strength is, you can attain anything you wish. It is a nice message that I feel is born out of the story and really not something you get in a baseball book that often. All baseball fans will enjoy this. It is an interesting story both on and off the field, and its underlying message is one that will benefit everyone. Sometimes you life plan doesn’t work out as expected, but in the end result may be greater than you could have ever imagined. Sportscasters and reporters become part of the game. No matter what city you are in you can always find one that appeals to any fans style. In each city around the country there are dozens of these guys enhancing the fans experience. 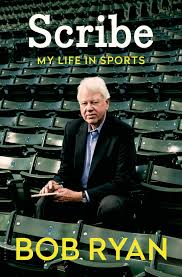 Bob Ryan has spent his career in Boston assessing various sports and relaying his interpretation of the games to his fans. Bob Ryan like most writers is opinionated. He works on a daily basis to his thoughts, feelings and interpretations to the masses in hopes of finding agreement. It has to be a tough job being in this line of work. Between deadlines, traveling and the stirring of the masses, it eventually has to become a grind. Ryan’s new book has it all covered. From his upbringing in Trenton NJ, to his time with the Boston Globe. He covers it all, from his childhood seeing the greats of various sports playing the field and covering one on one, some of the greats of the game professionally. The book almost reads like one of Ryan’s columns. Its opinionated and fast-moving throughout. While its appeal may only be regionally, it still is an interesting read. It keeps you interested throughout and if you are not familiar with his work, you will be by the time you finish this book. That is important for the readers outside of Bob Ryan’s coverage area. You will get an honest feel as to what his work is really like and gain an appreciation for it. The book is very heavy in Boston coverage as you would expect since has spent a majority of his life there. The opinions are strong and the writing is good, so fans should enjoy it. By now we all know who Rick Dempsey is. A serviceable catcher who put up decent numbers, but was never a Hall of Fame caliber player. 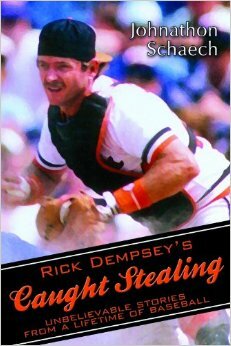 Even with those types of numbers it seems Rick Dempsey is almost a folk hero to the fans of the Orioles. That brings us to today’s book……. By Jonathon Schaech-2014 Cemetery Dance Publications. Folk hero is the only reason that I can come up with as to why we need this book. Other than becoming the 1983 World Series MVP, he had an ordinary career. My other thought was that maybe Dempsey wanted to be like everyone else and rake in some extra money from writing a quick autobiography. The only problem with that second idea was that Dempsey didn’t write the book and is talked about in the third person throughout most of it. Except for a few select quotes in each chapter there does not seem to be much of the subjects influence throughout this writing. The author grew up in Maryland and is an Orioles fan. So that explains to some degree why he chose Dempsey. His writing style almost comes across as “why don’t you all pull up a chair, because I am gonna tell ya a little story bout Rick Dempsey“. Which is great if it works, but I don’t think on a player biography it necessarily works. It almost felt like it was some sort of hero-worship book that was written by a fan with some bias towards his career. I have had the same problem of not enjoying this kind of writing style with Jimmy Breslin’s books as well. So maybe it is just me that is the problem with this book. By no means am I trying to knock Dempsey’s career here. I think he had a career to be proud of with his skills and has made a success of himself both on and off the field. I just think the author missed his mark on this book, whatever that mark was supposed to be. It’s a small book, approximately 130 pages, with photos and a few dead pages between chapters. So for the price of the book, I don’t think you are getting much bang for your buck. The low number of pages also force the book to lack any type of detail to any subject matter. With so many other baseball books out there you get more product for your dollar. Orioles fans will love the book I am sure, and think I am out of my mind with this review, but I’m just being honest. If you can find the book for a discounted price pick it up and read it, maybe I just expect to much out of a player biography. In the grand scheme of life baseball is not all that important. I know that sounds weird coming from a guy with a baseball themed blog, but its true. Sometimes we make it more important than it truly is for whatever reasons we choose. When it comes down to it what to we remember the most? Is it a spectacular game, great play or the people themselves that make it special. For me it has always been the personal attachment you get to a team that makes it special. There are certain voices in the dark, that have come into our homes night after night that become part of your family. Tonight’s book is in remembrance of one of those voices that went silent today at age 91. For those of you who live outside of Philadelphia you may not be as familiar with his work as those who have lived in the area. Bill Campbell, “the Dean of Philadelphia sports”, was a well deserved and cherished title. He was witness to some amazing sporting events throughout his career which spanned back to 1939. Even through trials and tribulations he handled any adversity with grace and dignity which became his trademark until the very end. 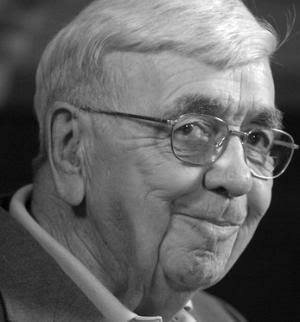 Campbell was a well-rounded, knowledgeable announcer, covering Basketball, Football as well as Baseball. He has been inducted into various Halls of Fame and was a voice in the night to generations of sports fans. Thousands of Philadelphia kids went to bed at night with their transistor radios on and that distinctive voice keeping them abreast of their heroes triumphs. Bill witnessed so many amazing Philadelphia sporting events that it is almost hard to comprehend. He saw Wilt Chamberlain’s 100-Point game, The last Eagles championship in 1960 and of course the season ending collapse of the 1964 Phillies. For me as a Philly sports fan, those three things alone are bigger than everything combined that I will ever see in sports in my lifetime. As great as Campbell’s career was there is one sad note. As a baseball blog I feel compelled to mention it. That is the unceremonious dumping of Bill from the Phillies broadcast team to be replaced with future Hall of Famer Harry Kalas. Now we all know Kalas went on to an incredible career of his own, but the way the Phillies handled it was pretty crappy! I have never seen written anywhere of Mr Campbell ever uttering a bad word towards the Phillies in regards to his firing. To the contrary, he almost seems hurt at the way it happened. Sam Carchidi does an incredible job of chronicling Campbell’s career in this book. Throughout the entire book you feel like you are just listening to an old friend tell a story. It’s almost as if he is too modest to even want to tell his story, but you do hear some underlying pride in his career as the stories come forward. 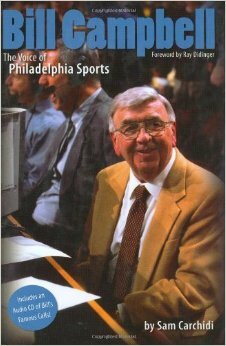 If you have any interest in Philadelphia sports I can not recommend this book enough. The author and the subject make an incredible pair and bring the stories to life. You will not be disappointed! On a personal note, I collect autographs through the mail. I wrote to Mr Campbell earlier this year and asked him to sign a picture of himself during his Phillies announcing days. On the back of that picture he wrote “the Phillies family has been very kind to me through the years”. How do you not respect a man who after they screwed him over, he still has the utmost respect for them. To me that showed true class and people like that are hard to find in this day and age. Also his daughter Christine found my parents phone number somehow and left a very nice message about how her father was honored that someone remembered him. Quite to the contrary Mr Campbell. We are honored you chose to share your life and talent with us, and the void will be impossible to fill. The last of the great ones is now gone.